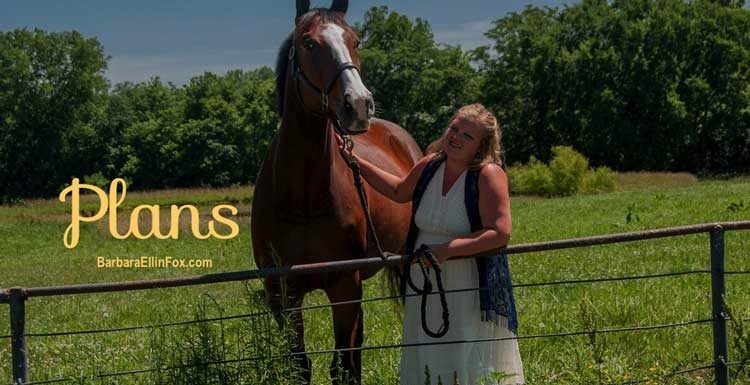 I live by plans, whether it is the future with the horses, teaching riding, training, or writing. I have a plan for everything, my horses, my manuscripts, both fiction and non-fiction. When teaching riding, I have a plan for the day’s lesson, but I also have a long range plan for each student. The same applies to training horses. There are the immediate issues to work through, but there are also the steps, parts of the plan necessary for developing a willingly cooperative riding partner. It takes years to develop a good rider. After a rider learns to control their own body they have to train that body in new skills. Even at the most elemental level, the person has to develop muscular reflexes, learn a whole system of communication, and they have to learn to think fast and under pressure. They do all of this, not with a vehicle you turn on with a key, but with an animal who has an active mind, fears, instincts, habits and needs of their own. Is there any wonder it takes a long time to learn to ride well? It’s a continuous project without a definitive end. Horses are not born trained to stop when you pull on the reins, or turn when you direct them. Those actions make the horse uncomfortable often causing him pain. A horse’s normal flight instinct, to run away from pain, is paramount to his survival. Imagine how frightening it can seem for a young horse, or a wild horse, when you tie his head to a solid object with a lead rope. He suddenly finds himself deprived of the ability to use his most basic instinct. It takes time and a logical plan to train a horse. More often than not people short cut a horse’s training to reach their specific goal faster. This happens frequently with young race horses. They learn to carry a rider, steer on wide turns around a huge oval, and they learn to break from a starting gate. Often the race horse is ponied, meaning he’s led to the track or starting gate by a handler on another horse. The better trainers teach their young horses basic skills like tying, steering beyond just a few turns, how to work three basic gaits, which leg to lead on at the canter, etc, but better trainers implies there are trainers who are not very good. Unfortunately the highest percentage fill the latter category. There are about 20,000 Thoroughbred foals born in the U.S. each year. About 65% of those are strong enough to make it into racing. Not many racehorses are winners, and up until recently most used up race horses ended on the trash heap at a very young age. Even Ferdinand, winner of 29 races including the Breeder’s Cup and the Kentucky Derby, ended life in a Japanese slaughterhouse. Accountability for ex-racers has increased in recent years and programs like Friends of Ferdinand and Thoroughbred Aftercare Alliance work toward rehoming ex-race horses. I’ve worked with a lot of ex-racers. The basic foundation they receive as a youngster has a lot to do with their success in new careers after racing. Alisha’s horse Bow is a good example. Bow was born among the elite in the heart of Thoroughbred country, Kentucky. He was conditioned and groomed for the fancy Keenland sale as a yearling. Bow has outstanding ground manners. He ties well, grooms, is good for the farrier, loads in a trailer with ease, all the things he was taught to in preparations for the Keeneland Yearling Thoroughbred Sale. Bow lived the good life as a baby which is evident by his character. From Keenland he went into sketchy race training in Oklahoma. In his career Bow raced five times. He won 1 race, was second once, and third once. After his fifth race he disappeared into a cattle lot. Alisha bought him from a dealer seven years later. At the time Bow was skinny, wormy, depressed and had some cattle lot wounds. Bow’s years between the race track and Alisha were filled with rough handling and no training. Fortunately, Bow kept his kind nature, but some of his riding issues are deeply imbedded mentally. Alisha has worked for several years to overcome Bow’s trauma from bad bits, bad head restraints, and bad riders. Bow’s issues would have made many other trainers give up. Like her mother, Alisha plans, only Bow’s training issues, and the curve-balls life throws in a young person’s path, have caused her to alter those plans over and over. Flexibility makes plans succeed. My dad advised repeatedly to “roll with the punches.” Horse trainers and riding instructors learn early that things don’t normally go according to plan, especially when you work with another living creature. We learn to adapt, change our plans, and be satisfied with small progresses while keeping our focus on the big picture. Incidentally, experience as a riding instructor and horse trainer is an excellent background for a writing career because they both require patience, endurance, a teachable mind, and flexibility. Alisha hasn’t been able to ride Bow as regularly as she’d like. She lives forty minutes away and works full-time, plus we’ve spent more time under heat advisories lately than not, and then we had days of torrential downpour. And there’s this thing going on with her hands that makes it almost impossible to hold the horse’s reins. Sigh. The things that impede progress. This morning I was surprised when Alisha arrived during my quiet time with God. I always wonder how He feels when I interrupt our time for something else. But since He’s always with me, I don’t worry. Alisha’s hands were better this morning, and she could hold the reins. The scheduling part of my brain intended to continue with my day while she rode Bow, but another brain-part made a cup of coffee and carried a lawn chair to the arena. As I sank into my comfy chair to watch my daughter on her 17.1 hand project thoroughbred, my spirit soothed. The horse was quiet, in good health and at peace. Alisha smiled and walked Bow with loose reins. The temperature was perfection, and serenity wrapped around me. It felt natural and right, part of who I am, the world God created for me. When Alisha finished riding she commented that today may have been her best ride ever on Bow. It was one of those special, simple God effected changes of plans, and it started both our days well. It probably even gave Bow’s day a good start. The absolute best part of making plans is when God establishes my steps. When He delights in my way how can I feel anything less than peace? Has God ever changed your plans in a simple way, even just for the morning? Beautiful, the stories, photos, verses. Really enjoyed your post-Barbara. My congratulations to Alisha. Her circumstances with Bow are something which I understand. Patience has its rewards as I know. I love how you can draw analogies from EVERYthing :-). This is a great message for me personally, because I always used to struggle when my plans were thrown. I wasn’t being flexible. Lately, however, God has shown me He’s got everything in hand. He’s got the reins on my life, so I can sit back and relax a little more than I used to. God’s plans are better than mine. Lara- Blessed is the person who learns early that His ideas are the best. I wish I’d caught on a little sooner! And look—You made an equestrian reference! By the way I am really enjoying your blog https://storystorming.wordpress.com . You have terrific advice for writers and I love your sense of humor.